What was that well-worn narrative spun by the Premiership about the Celtic League again? Something about us resting test players ahead of big matches, which apparently was a bad thing? If that's true then why is there a full list of Pro 14 matches this weekend when across the water they have the glorified series of friendlies that is the ‘Premiership Cup’? Of course the Celtic test players will be rested but at least there will be round of meaningful matches for them to miss! Former St. Michael's and current Trinity College Rugby lock Jack Dunne is set for his Leinster debut off the bench against Scarlets…He's a student of theoretical physics in Trinity and earned over 600 points in his Leaving Cert. 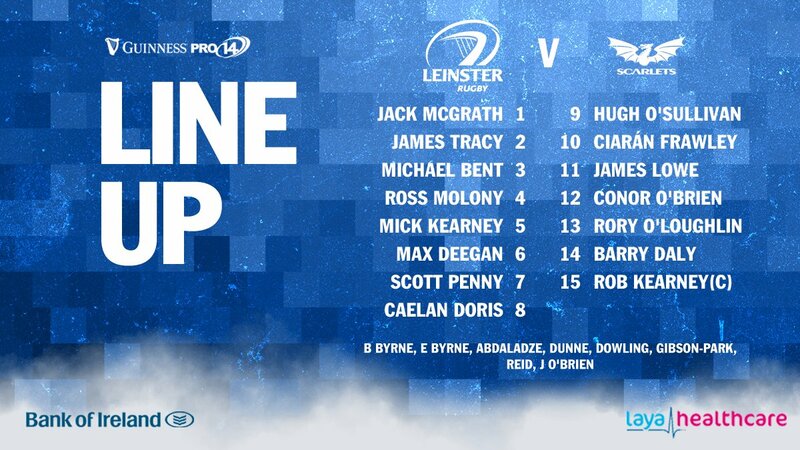 A decent introduction for the latest to be rolled off the Leinster academy assembly line, and this alongside a squad that I'd wager has at least half a dozen further names the majority of blue-clad spectators tonight at the RDS would not have known this time last year. I mean Rory O’Loughlin and Ross Molony are virtual veterans at this stage! Yet the results keep on coming so you have to assume the quality from the ‘newbies’ will continue accordingly…best of luck to Jack tonight. But despite the fact that there's so much youth on show, ti's is still a matchday 23 that contains 2 Lions, one of them a double-Grand Slam winner, last season's Pro 14 top try-scorer, a recent captain of the Ireland Under 20s, both man-of-the-match and the bonus point try-scorer from last Sunday's win over Wasps, and of course James Lowe, who only needs his name to suggest what he brings back to our lineup. And it's a massive night in particular for our halfbacks pairing of Hugh O’Sullivan and Ciarán Frawley. Their task is to knit all that youth and experience together and this will be a huge test for them tonight. Possibly the last thing anyone wearing blue should do ahead of this match is look at the Conference B table, where Leinster hold a ridiculous advantage over the other six clubs. 19 match points more than the nearest rival, 20 tries and (my personal favourite) 230 points difference over the Scarlets. Does that mean we can afford to be complacent? Of course not. The Welsh region had an awful run over the Christmas period but still find themselves locked in a four-way battle for just two playoff spots on the table, so despite the fact that they also have youth in their squad, they'll be looking to come away from D4 with something. In an age where Leinster seem to be throwing out superstars to the world every other week, Max Deegan has flown relatively under the radar yet impresses every time I see him. Great in the loose, reliable lineout option, always a candidate for a try, and also very good as an actual number 8 at scrum time so we'll get to see his versatility tonight on the blind side. Then there's two of the stars from Leinster A's successful Celtic Cup campaign, each with their own specific talents. 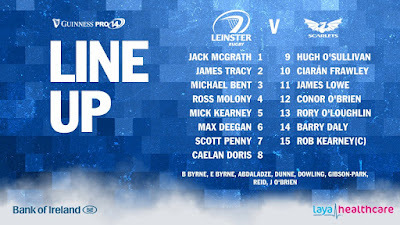 I have said it many times before but Scott Penny seems to have gone to the Sean Cronin School for Scoring Tries from Lineout Mauls while Conor O’Brien with his Henshaw-esque strong runs from 12 gets another chance to continue his fine form this season. So as you can see there's loads to like about this lineup, and while I'm expecting the approach to be mostly methodical (apart of course from our number 11 who has earned the right to try pretty much anything that comes to mind on the night), we have ever reason to believe that it can be effective. The bookies have us down to win by 18; I'm going to put my faith in our coaching staff's ability to prepare this latest patchwork selection enough to build an early lead and bring one home that's in the low 20s. Replacements; 16 Dafydd Hughes, 17 Dylan Evans, 18 Simon Gardiner, 19 Josh Helps, 20 Ed Kennedy, 21 Jon Evans, 22 Morgan Williams, 23 Tom Prydie.